When you get back from a trip, you're usually bursting to tell everybody all about it and share your photos. Organizing your pics by location makes it easier to describe your adventures. Classifying your photos begins as soon as you get home from vacation. A good approach is to create a virtual map showing the stages of your trip embellished by photos of specific locations. With the right know-how and tools, you can quickly create eye-catching results. To assemble the map with images, you need the proper information, such as timestamps, geographical longitude and latitude data, and viewing angles and directions. Linking objects with this data is called geotagging, which makes it easier to work with media data. Information for geotagging comes from digital camera or smartphone sensors. A GPS module is already a standard feature of many mobile devices. You can purchase a digital camera with GPS for a few hundred dollars. The sensor data that the devices collect usually ends up automatically in the Exchangeable Image File Format (Exif) file for each photo . As the past few months have shown, intelligence services have been tapping personal profiles from this metadata to find out where photographers are and even what technical equipment they are using; therefore, it's best to use this function with care or even deactivate it in times of continued digital surveillance. Using appropriate interfaces, you can read the Exif files of digital images any time and modify them as you like. 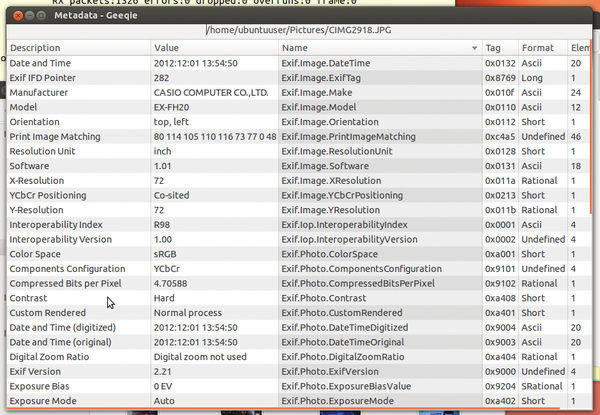 Image viewers like Geeqie  can display the Exif file data (Figure 1). Command-line programs include Exifprobe  and Exiftran , which you can use for rotating JPEGs by taking into account the image orientation. Figure 1: The Geeqie image view provides the Exif data for an image. The comprehensive ExifTool  Perl program also includes a personal development library. Moreover, Pyexiv2  and its successor, Gexiv2  are a boon to Python developers. The Python Imaging Library (PIL)  uses similar methods that are unfortunately undocumented and, therefore, must be used with caution. GIMP by itself can already do a lot. With plugins, you can extend the free image editor with complex functions, most of which allow you to see the final results before you apply them. An old EeePC with Linux is great solution for creating a powerful off-road navigation system. Putting together some of the components involves some tricks, however. Photivo closes the gap between RAW converters and easy image editing, thus making often required reworking in other programs unnecessary.